This lean, delicious tilapia is a snap to prepare and bake. The fish takes just minutes to fix and cook. 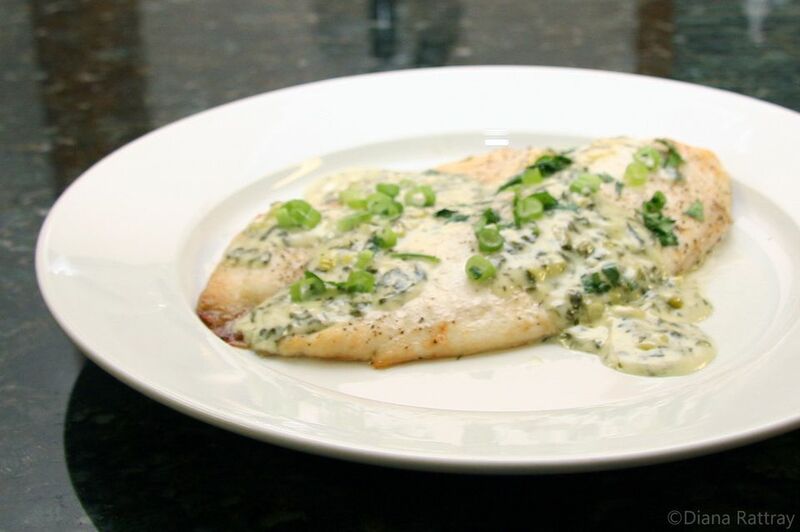 The fillets are served with a tasty green onion, lime, cilantro cream sauce. Serve the fish the sauce and hot cooked rice or baked or roasted potatoes. Add steamed vegetables for a perfect family meal. A serving of fish, according to the American Heart Association, is about the size of a checkbook, or about 3.5 ounces cooked. They recommend two servings of fish a week. As an added bonus, tilapia is not only mild and budget-friendly, it's low in mercury. Line a baking pan with foil; spray with nonstick cooking spray. Brush the tilapia fillets lightly with butter and arrange in the prepared pan. Sprinkle the fillets lightly with salt and pepper. Bake the fish for about 20 minutes, or until the tilapia is cooked through and flakes easily with a fork. Heat the olive oil in a small saucepan over medium heat; sauté the garlic and onion for 1 to 2 minutes. Add the heavy cream and bring to a simmer. Simmer for about 3 to 4 minutes to reduce slightly. Stir in the fresh chopped cilantro, lime juice, and zest, and salt and pepper to taste. Simmer for about 1 minute longer. Drizzle some of the sauce over each serving of fish. If you aren't a fan of cilantro, substitute chopped fresh parsley in the recipe.